Today, the world is a little fuzzier; my body a bit more tired. I can thank the good folks at Tippler’s Tap and Bacchus Brewing for that. I am feeling surprisingly fresh for the high ABV beers that were presented last night. The fact that I’m able to string together a coherent sentence should be proof of that. 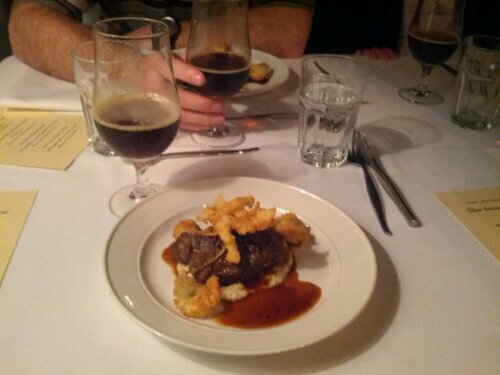 Slow braised and barrel aged was the theme for the night, with 4 dishes being paired with a Bacchus aged brew. I know I promised “no fancy food”, but I’m going to make an exception this time. First dish was a Mushroom, truffle, and goat’s cheese risotto with a red ale reduction. I love mushrooms, so this was the perfect start. 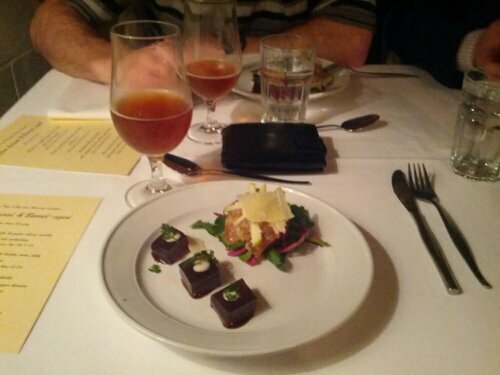 The risotto was nice and creamy and the goats cheese matched beautifully with the Flanders Red Ale (9.3%). 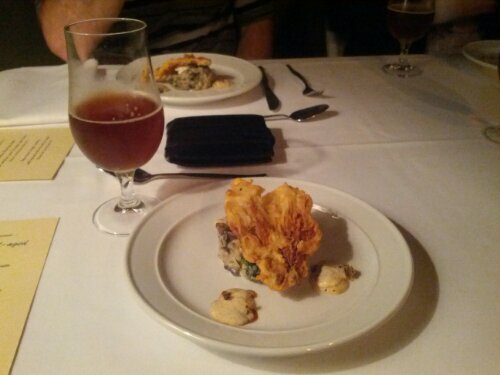 The beer itself was a lovely sour that helped cut the richness of the dish. There was also a bit of grains from the mash in the risotto itself! Second dish was a confit of pork belly with barley wine jelly and thyme jus. Pork belly is something that I could eat morning, noon, and night. I absolutely loved this dish. The jelly was the perfect compliment to the saltiness of the pork belly. Everything on the plate just worked. The Toy Box Brewery barely wine, though strong at 13.2%, was very mellow due to the aging and worked perfectly. Next up, we had what could be considered the main. The Red Bellied Black beef cheeks with cauliflower puree and crumbed caper berries sounds fancy, looks fancy, and tasted fancy. The meat fell apart the moment your fork got close to it, and it literally melted in your mouth. The Barrel aged Red Bellied Black that paired it was much better than the first one I tried. The rum barrel aging added a new depth of flavour and the massive 14.1% ABV warmed you up pretty quick. I want kegs of this stuff. Final dish of the night was a warm bread and butter pudding with hazelnut praline and malt ice cream, matched with a Bacchus Tamira Porter (8.9%). 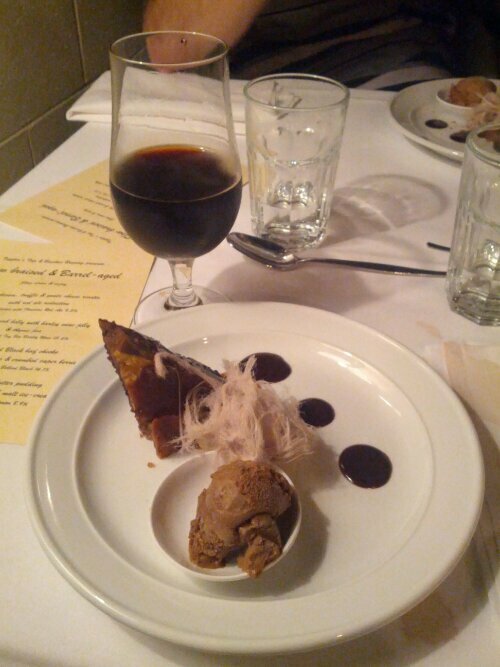 You couldn’t dream of a better dessert/beer combo. The rich coffee flavors in the porter complimented the sweetness of the pudding. The ice cream itself was heaven. I’m not a chocolate person at all, but I would happily easy this after dinner every night. The closed door event, I’ve been told, sold out in under 36 hours. If word gets out about last night’s event, I would imagine the next one will go even faster. If you are not already, make sure to Like the Tippler’s Tap Facebook page and keep an eye out for upcoming events. It’s definitely worth the effort.